The B7 FLIGHT is the FLEX version of our award-winning original Pilot Flight Bag updated with End Caps to allow even more flexibility. 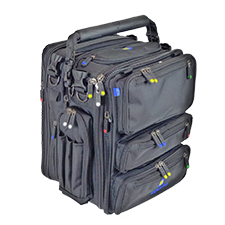 The B7 FLIGHT is the perfect Pilot Flight Bag for VFR to light IFR and can satisfy most pilots needs. It's also a great travel and business bag since it will hold a 13? laptop plus accessories. The outside dimensions of the B7 are 13.5" x 11.5" x 9? offering a combined 7 inches of interior storage in the two main compartments. The B7 is assembled by combining a Pocket Cap Front, a Center Section 4, a Center Section 3, and a Flat Cap Rear with one Side Pocket Alpha (Radio Pocket), and one Side Pocket Charlie (Pen Pocket). The Pocket Cap Front offers a variety of pockets organized into three Main Pockets and six auxiliary pockets. The top Main Pocket area is designed to hold your mobile device, wallet and keys. 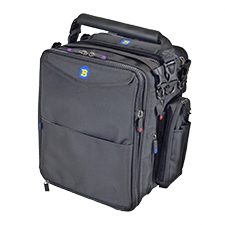 The middle and lower pockets can store your electronic E6B, camera, business cards, iPods, chargers, batteries, etc. The auxiliary pockets are perfect for storing flashlights, fuel testers, and multi-purpose tool. The Center Section Four offers four inches of storage space and comes with a divider shelf attaching to the side walls of the main compartment with Velcro. This shelf can be positioned right where you need it or removed for full access storing one or two headsets or GPS. Access is through a unique top zipper design that also opens the entire length allowing you to reach all the items above and below the divider shelf. On top of the bag is a pocket for sunglasses. There are two FLEX Mount Pocket stations on both sides of the Center Section Four. 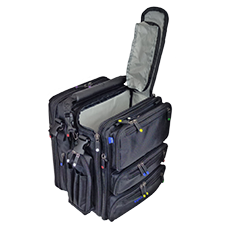 The Center Section Three offers three inches of storage and easily carries 13" laptops, some 14" laptops, tablets as well as documents, folders, clipboards, etc. The Flat Cap Rear offers two flat pockets on the outside. The primary pocket is accessed from the top and has a cover flap that is secured with Velcro. There is a second flat half-height slip pocket that acts as a great place to store a couple of basic documents that you want to have easy access to such as today's checklists or your boarding pass. This half-height pocket offers a zipper across the bottom opening 9 inches to allow it to slip over the upright handle of your folding cart or rolling suitcase. 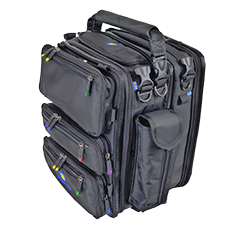 Besides being the perfect Pilot Flight Bag for aviation, the B07 is great for traveling and business. Load it up with your 13" laptop, your iPad, snacks, pillow, DVD's, magazines, etc. And, while it will fit underneath the seat in front of you, if you want more foot room, just zip it in half and put the unneeded part into the overhead bin during the flight. Opens and closes in seconds providing easy transport of your BrightLine Bag. 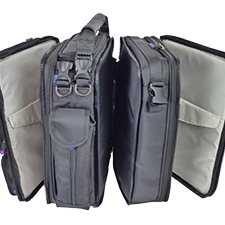 The Brightline Flex system pieces DO NOT work with previous BrightLine Classic Bags, they only work with the FLEX System line of bags. The B-Zero SLIMis a clever daily bag for iPads, Ultrabooks, and assorted technology and personal items. Organize all your small stuff once and then you have everything with you no matter which configuration you build. 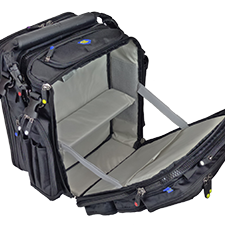 The B4 SWIFT is the FLEX System VFR Pilot Flight Bag and Carry On travel bag. A Flight Bag or Travel Bag that can handle all your gear. Adaptable by adding or removing center sections as needed.